Our range of products include semispherical wooden floor lamp, lady with a hat wooden floor lamp, wooden chandeliers and wooden floor lamp conical shade. 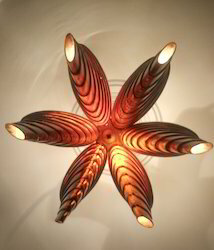 We are counted as one of the leading manufacturers and suppliers of Semispherical Wooden Floor Lamp. Owing to its amazing mosaic pattern and eye-catching appearance, the rendered semispherical floor lamp is highly demanded. By using high grade materials, the rendered semispherical floor lamp is precisely design in accordance to the market trends. 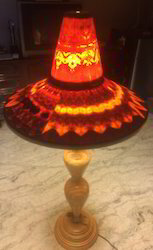 Leveraging by the vast experience of this domain, we manufacture and supply the premium quality of Lady With A Hat Wooden Floor Lamp. Used for interior decoration purposes, the rendered a lady with a hat floor lamp is manufactured by using latest technology. Driven by an intense desire to attain maximum customer approval, we assure that the quality of a lady with a hat floor lamp is never compromised. Valued as a reliable manufacturer and supplier, we render the premium quality of Chandeliers. Available with us in various sizes, the rendered Wooden Chandeliers is known for its resistance against termite, elegant design and eye-catching appearance. Strong logistic support has helped us in delivering the rendered wooden floor lamp within promised time frame. Valued as a reliable manufacturer and supplier, we render the premium quality of Wooden Floor Lamp Conical Shade. Available with us in various sizes, the rendered wooden floor lamp is known for its resistance against termite, elegant design and eye-catching appearance. Strong logistic support has helped us in delivering the rendered wooden floor lamp within promised time frame.